My Writing | Oh, for the HOOK of a BOOK! I hope you have had a wonderful holiday season full of happiness, food, family, and relaxation, but most of all love! As for us, we had a wonderful Christmas. We were able to drive the eight hours to Washington D.C. and see the sites for a day or two with my son, who attends college there (except for the National Christmas tree I so wanted to see up close – but a gentleman climbed to the top of it and security shut down the lights and were in droves everywhere just at the time we headed down to see it! ), and then, bring him home with us in time for Christmas Eve and Day. It’s been a house full of love and laughter since he’s been here with us. I am enjoying my time with my son again. And I am loving having my daughters on break from high school and middle school as well. We’ve spent so much quality time together. On a sad note, I also lost someone very dear to me a few days after Christmas and I’m still processing that. …I just want to wish everyone a very HAPPY NEW YEAR! I hope for ALL there is success, health, happiness, joy, love, inspiration, and friendship. I hope there are more quiet times, more writing time, more discovery of art and nature, more one on one with people you know or meet. Cheers to the beginning of a much better year. I am anxiously awaiting 2019 to be better than this year I am soooooooo happy to put behind me! If you’re still in my life, or want to be, and are coming along for the ride, I welcome you with open arms. I have a 1,000 word Christmas story, a haunting Christmas story in fact, in the vein of the old Victorian fireplace ghost stories, to share with you too if you haven’t yet seen elsewhere for yourself on the Ladies of Horror flash project site. I’ll share that below, and though the initial photo prompt was the impetus, I’ll share in another post soon some photos of the place (Kingwood Gardens and Mansion in Ohio) that inspired even more of the story. I hope you like it! Best New Wishes for a Happy New Year! I like writing from prompts, so when Nina sent me a photo as a writing prompt for her Ladies in Horror monthly challenge, I was ready for the challenge. Having supposed to have written a poem or flash fiction up to 300 words, I of course, went on to write a 1,100 long flash fiction. Luckily, she still accepted. So click the link to Nina’s site and read my story “The Purple Hex Society.” Leave a comment and let me know what you think. I’m thinking of expanding the The Purple Hex Society (the organization) into a larger piece or series of work. Thanks so much to Jason Parent and Dustin LaValley for pre-reading and offering great advice and to Tim Busbey for editing it. A special thank you to Nassem, my 18-year-old son for his advice which made me re-think the end and turn it into something special. I meant to feature a post for Valentine’s Day on the site, but last week ended up intense and busy in the indie horror world and other work priorities took up my time, as well I had been pretty ill the days before and was still recovering. Certainly, February (as a whole) is available for talking about love, is it not? Even love gone awry? I suppose we can talk, read, and write about it any time, I know I do, so it’s always a good time in my book (well, IN my writings, if you read them, love is not always a good time). Whether you spent Valentine’s Day happy in love, alone and happy, or crying, I’ve got something myself to say about love. It takes on many forms and is often fodder for writers like me to explore. First, I’d draw attention to my poem “Chained by Love,” which was featured in the February 2018 issue of Enchanted Conversation: a fairy tale magazine. My poem showcased the love between moral Raymond and sea serpent/mermaid Melusine in medieval France folklore. You’ll see their happiness takes a different turn. You can read it for free in the magazine HERE. I’d like to again say thanks to them for choosing my piece to publish and for putting out such a gorgeous edition. On a different note, I failed to announce on my site here at the end of the year, but I have a story called “The Heart of the Orchard” featured in the anthology HARDENED HEARTS, which released from Unnerving in December 2017. It’s been widely reviewed, shared on social media to high regard, and I’m pleased that my story has been doing quite well. My story is like a crime/serial killer/revenge story wrapped up with a fairy tale vibe. It’s a little bit of something I’ll always do to have a bit of the feel of grim fairy tales in my work. I grew up with Brothers Grimm, Hans Christian Andersen, and other folklore inspiring me and it’s not unusual it transferred into my work. The darker the better, but for me, it’s a way of dealing with trauma and fears. I was also thrilled that for some, my story resonated, or they found it worthy of special mention. I know that my story, besides having some fantastical components, can also be unsettling because it’s based on some trauma I experienced in my own life. I channeled this into my character, and though she was not privy to it herself (and you’ll see why if you read the story), it had wreaked havoc on her soul and she sought out revenge. I think it is the ultimate in hardening a heart and it was what propelled me to write it when Eddie, the editor/publisher, told me the theme. In my dark poetry and fiction collection, BREATHE. BREATHE., being in relationships is explored because I wrote my emotions about living in a domestic violence situation for many years into some of my poems. I know they are quite heart-wrenching, but keep in mind, I did live this too. It’s been a process, but nothing has worked quite as good for me in healing over these last 14 years than in finishing this collection and sharing it. If you like love gone wrong, stories about domestic relationships, whether to connect or get a bird’s eye view or for suspense, and you like books like Gone Girl, Dolores Claiborne, Rose Madder, Big Little Lies, and other such, you may want to give some of the poems and stories in my collection a try. For the stories, I’d especially recommend my “Vahalla Lane” mini-series of fiction. And I just want to say after all this darkness, I did have a very nice Valentine’s Week, spoiled by time with my kids and making unicorn Valentines, lots of hugs, kisses, and love from both Tim and the kids, and some chocolate and a beautiful flowering rose cactus. I am happy to have a family understand love gone wrong, but also love done right. As much as I love dark fiction, I also love good suspense thrillers, historical fiction (including some with romance, especially if they are biographical about women in history), and mysteries. I’ll have some posts about those coming up soon. If you have some good book suggestions in this realm, or comments on any of the above, please feel free to comment. I love them! Very excited! 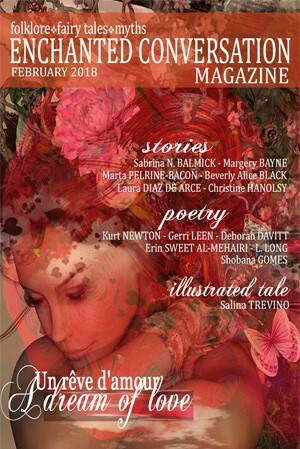 It’s February 1 and that means that the February issue of Enchanted Conversations: a fairy tale magazine has arrived! You can now read my poem, “Chained by Love,” which is about a sea serpent/mermaid from medieval French folklore and her love Raymond. Fairy tales don’t always end happy, though. This is an e-zine, and so with my poem, and all the other stories and poems featured, you can go to the link (near end of post), click on each individual piece of cover art like the beautiful one for my poem below, and viola – free to read. I really love the art Amanda Bergoff did for my poem, it truly captured the Gothic feel of medieval France and the beauty and longing depicted of Melusine. As a professional writer, I’m pleased they paid for each piece, but they are free to read for you, so please support the site anyway you can. Enjoy! Read “Chained by Love” HERE. Love can be magical or tragic, star-crossed or end happily ever after–an unrequited love for another or two souls that are meant to be. In this issue, we asked writers to explore the different aspects of love through stories, poems, and for the first time in the magazine, an illustrated tale in digital format. How do you search for a love who does not want to be found? Can the secrets of a mountain draw lovers together? Does Hades look different when seen through Persephone’s eyes? Can you find a knight ready to champion your cause, speeding through the desert with the lights of Vegas in the distance? Is a rainstorm at midnight or a snowfall at dawn the gift the sky gives when it falls in love? Should love hold one captive from its true being?…and more tales and poems on the intangible, glorious, frustrating, beautiful idea of the dream that is love. Follow this link to go to the magazine to read all the stories and poetry and see all the gorgeous art! I very much appreciate being included in this wonderful issue. Please let me know your thoughts. What is your favorite love duo in myth and legend?